Following the release of firmware updates for NEX head units, Pioneer's website was inundated by heavy traffic. 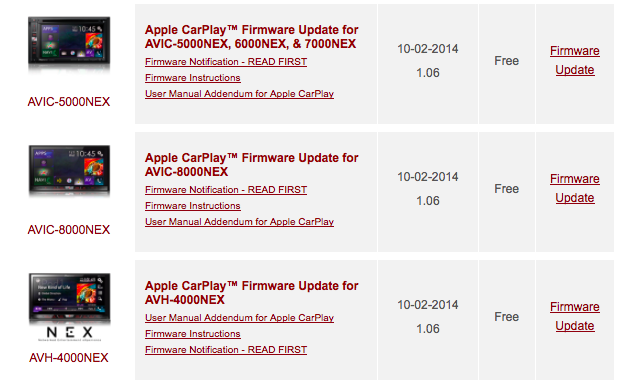 NEX customers every where got on to the site to download the update which enables Apple CarPlay on the head unit. Just a few hours after the site was having problems loading, Pioneer announced they have fixed the problem. As a result, you can now get on the site and download the firmware for your corresponding head unit without any issues. Pioneer NEX Head Units: AVIC-8000NEX, AVIC-7000NEX, AVIC-6000NEX, AVIC-5000NEX & AVH-4000NEX. Head on over to pioneerelectronics.com/firmware and find the file you need. Do not use direct links to the files that may have been shared on Facebook or Twitter or other sites. Pioneer advises users to use their website for downloading the firmware. Copy the file onto a USB Flash Drive or MicroSD card (depending on your head unit) and install. See other posts on our site on how to update the firmware. If you still have problems downloading the firmware, wait for a few minutes and try again. Pioneer assures the site is up and running again and all links are active. Good luck and happy updating!